There is no minimum number of hunters required for turkey season. Large parties will be broken into smaller groups as needed. Bag Limit – 2 Toms, Rio or Eastern, per man/season by permit only. Permits may be purchased in advance from the Kansas Dept. of Wildlife and Parks or upon arrival. Permits are not valid for the first 12 hours following purchase. Includes noon meals and beverages during the hunt. You can see your bird working to the call and feel your pulse racing as you try to maintain your composure. 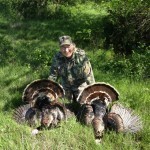 Turkey hunting in Kansas is sport for all ages (12 & up) and it’s a great time to be out in mother nature’s back yard. With our open countryside, it is not unusual to visually locate the bird of choice and then maneuver into a calling position for the shot. The hunt can be tailored to fit your level of conditioning or physical ability. With Easterns and Rios, we can put you halfway into a Grand Slam if you so desire. We get many clients that are pursuing turkey hunting’s biggest challenge, a Grand Slam, in one year. If this is your desire, please let us know and we will be glad to do our utmost to help you accomplish this feat. We can also recommend outfitters for the Osceola and Merriam’s varieties that will fill the remaining tags for your big four. Call for yourself or let us call for you. Many of our clients enjoy the thrill of calling in their own trophy Tom and we also enjoy seeing different calling techniques, so we’re happy to oblige. Kansas offers a great place to learn proper calling technique because the cover is usually open enough to provide a visual check of the effect of your calls on the love sick Tom. There are plenty of Toms and a multitude of opportunities for you to practice.